Do you have Irish surnames in your family tree? If the answer is yes, then read on – and discover more about the surnames of Ireland, where they come from – and see if you can spot some of your Irish surnames. Irish Surnames – All the Surnames on our database. When a new reader signs up for our weekly Letter from Ireland – we ask them to supply the Irish surnames in their family tree AND the county their ancestor emigrated from. So far we have collected over 21,000 Irish entries in our database of Irish surnames representing over 3,750 different surnames. If you’d like to join us and receive your FREE weekly letter from Ireland, simply click here to sign up. In this article, I would like to give you an overview of the surnames and counties that have been provided by our email subscribers – with some nice pictorials! First of all, you can see ALL of the Irish surnames in our database at the top of the page. Now, remember that there are 19,000 separate entries so you cannot see them all. The size of the name matches the number of times that name pops up with our readers – so you can see that Murphy, Kelly and Sullivan are clear winners there! Ok, now – let’s build things up slowly. The next graphic shows you all of Ireland’s 32 counties. You see, when someone provides us with the surname of an Irish ancestor, we also ask them which county they came from. Given that over 98% of our audience now live outside the island of Ireland, this is a good representation of where the Irish Diaspora has it’s roots in Ireland. The Counties of Origin for your Ancestors. County Cork is, by a long shot, the main producer of the Irish Diaspora down through the centuries and decades. Now, let’s get back to those surnames. The following are just the top 25 Irish surnames from our readers. Each one typically show up more than 100 times in our database. Is your Irish surname here? Like to add your Irish surname to our list? Just signup for your free weekly Letter from Ireland by clicking here. Let’s have a look at even more detail. The following are the 100 most popular surnames among our readers – a real spread from all around the country. We see names that are native Irish Gaelic, names that are Scots originally and some English/Scottish planter names. And just a few Norman and Viking surnames thrown in. Typically Irish! 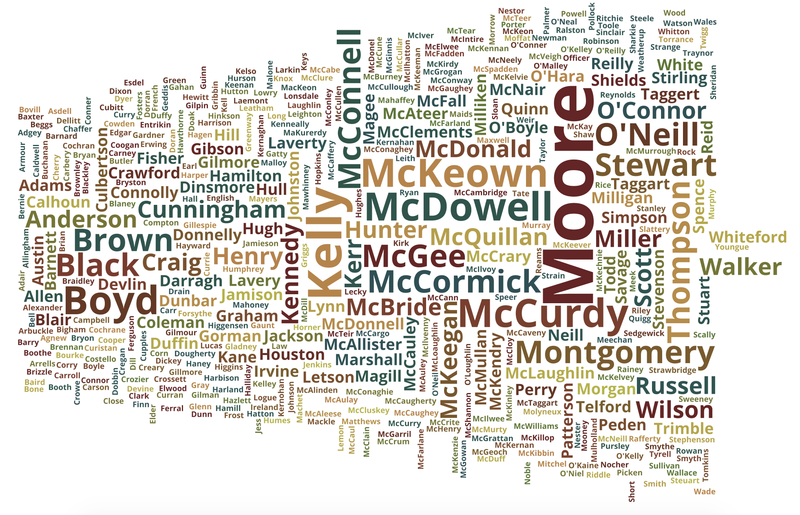 Top 100 Irish Surnames among our readers. Finally, here are the top 250 Irish surname among our readers – this is probably as detailed as we can get AND allow you to read all the names. Is your Irish surname here? (Click on picture to enlarge). Top 250 Irish Surnames Among our Readers. One of the things we invite our readers to do when they want to find out more about their Irish Heritage, is to pass on the names of their ancestors and the counties they come from (if known). We have been doing this since 2013 and now (December, 2016) have over 19,000 individuals on the list. They are segmented by county of origin (NOT necessarily where a surname originally came from, but where the reader says their ancestor came from). This means that some names will appear in multiple counties. You will see just what percentage of our total list of names came from each of the 32 counties. I have included the population of each county in 1841 (when the population was at its highest across most of the island) and 1961 (when the population was at it’s lowest). This gives you an idea of the relative size of each county as well as the effect of famine and emigration on the population between those two years. 4.8% of our reader’s ancestors came from County Antrim. The county had a population of 361,000 in 1841. This had increased to 690,000 by 1961 (this is complicated by the later creation of the ‘County borough of Belfast’—I included it here as part of County Antrim). County Antrim has the distinction of having the highest number of different surnames on the island of Ireland. In other counties, there are many dominant Irish Gaelic surnames that cover percentages of the population. However, Antrim has a history of being ‘planted’ by individual families carrying many distinct surnames from Scotland and England. Did any of your Irish ancestors come from County Antrim? (Click on picture to enlarge). Like to add your County Antrim surname to our list? Just signup for your free weekly Letter from Ireland by clicking here. 2.2% of our reader’s ancestors came from County Armagh. The county had a population of 232,000 in 1841. This had declined to 117,000 by 1961. A very ancient part of Ireland—home to many of our myths and contains the cathedral city of Armagh. Here are the names submitted by our readers for County Armagh—they believe that their ancestors lived in this county before emigration. Did any of your Irish ancestors come from County Armagh? Like to add your County Armagh surname to our list? Just signup for your free weekly Letter from Ireland by clicking here. 0.8% of our reader’s ancestors came from County Carlow. The county had a population of 86,000 in 1841. This had declined to 33,000 by 1961. Carlow town was once the capital of Ireland. A small, but varied, landlocked county. Here are the names submitted by our readers for County Carlow—they believe that their ancestors lived in this county before emigration. Did any of your Irish ancestors come from County Carlow? Like to add your County Carlow surname to our list? Just signup for your free weekly Letter from Ireland by clicking here. 2.5% of our reader’s ancestors came from County Cavan. The county had a population of 243,000 in 1841. This had declined to 57,000 by 1961. Here are the names submitted by our readers for County Cavan—they believe that their ancestors lived in this county before emigration. Did any of your Irish ancestors come from County Cavan? Like to add your County Cavan surname to our list? Just signup for your free weekly Letter from Ireland by clicking here. 5.7% of our reader’s ancestors came from County Clare. The county had a population of 286,000 in 1841. This had declined to 74,000 by 1961. Here are the names submitted by our readers for County Clare—they believe that their ancestors lived in this county before emigration. Did any of your Irish ancestors come from County Clare? Like to add your County Clare surname to our list? Just signup for your free weekly Letter from Ireland by clicking here. 15.6% of our reader’s ancestors came from County Cork. The county had a population of 854,000 in 1841. This had declined to 330,000 by 1961. Here are the names submitted by our readers for County Cork—they believe that their ancestors lived in this county before emigration. Did any of your Irish ancestors come from County Cork? 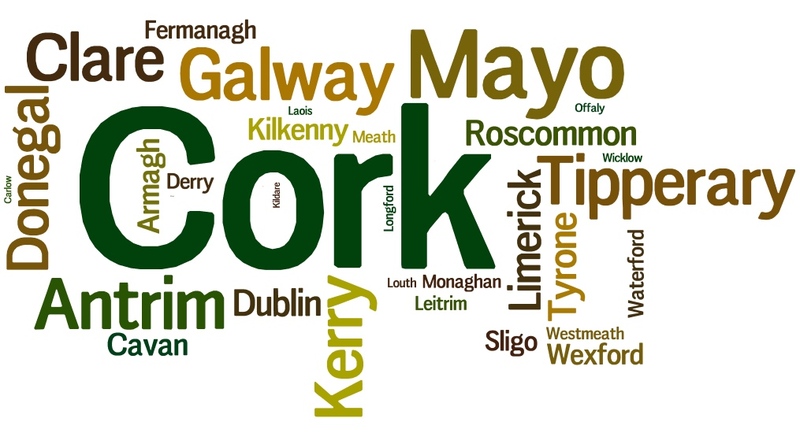 Like to add your County Cork surname to our list? Just signup for your free weekly Letter from Ireland by clicking here. 1.5% of our reader’s ancestors came from County Derry. The county had a population of 222,000 in 1841. This had declined to 165,000 by 1961. Here are the names submitted by our readers for County Derry—they believe that their ancestors lived in this county before emigration. Did any of your Irish ancestors come from County Derry? Like to add your County Derry surname to our list? Just signup for your free weekly Letter from Ireland by clicking here. 5.6% of our reader’s ancestors came from County Donegal. The county had a population of 296,000 in 1841. This had declined to 114,000 by 1961. Here are the names submitted by our readers for County Donegal—they believe that their ancestors lived in this county before emigration. Did any of your Irish ancestors come from County Donegal? Like to add your County Donegal surname to our list? Just signup for your free weekly Letter from Ireland by clicking here. 2.9% of our reader’s ancestors came from County Down. The county had a population of 361,000 in 1841. This had declined to 267,000 by 1961 (I included the County Borough of Belfast under County Antrim). Here are the names submitted by our readers for County Down—they believe that their ancestors lived in this county before emigration. Did any of your Irish ancestors come from County Down? Like to add your County Down surname to our list? Just signup for your free weekly Letter from Ireland by clicking here. 2.8% of our reader’s ancestors came from County Dublin. The county had a population of 372,000 in 1841. This had increased to 718,000 by 1961. Dublin city saw a huge amount of inward migration from the countryside over this time. As a result, many Irish surnames are most numerous today in the Capital city as opposed to their original territory. Here are the names submitted by our readers for County Dublin—they believe that their ancestors lived in this county before emigration. Did any of your Irish ancestors come from County Dublin? Like to add your County Dublin surname to our list? Just signup for your free weekly Letter from Ireland by clicking here. 1.9% of our reader’s ancestors came from County Fermanagh. The county had a population of 156,000 in 1841. This had declined to 52,000 by 1961. Here are the names submitted by our readers for County Fermanagh—they believe that their ancestors lived in this county before emigration. Did any of your Irish ancestors come from County Fermanagh? Like to add your County Fermanagh surname to our list? Just signup for your free weekly Letter from Ireland by clicking here. 5.3% of our reader’s ancestors came from County Galway. The county had a population of 440,000 in 1841. This had declined to 149,000 by 1961. Here are the names submitted by our readers for County Galway—they believe that their ancestors lived in this county before emigration. Did any of your Irish ancestors come from County Galway? Like to add your County Galway surname to our list? Just signup for your free weekly Letter from Ireland by clicking here. 5.5% of our reader’s ancestors came from County Kerry. The county had a population of 293,000 in 1841. This had declined to 116,000 by 1961. Here are the names submitted by our readers for County Kerry—they believe that their ancestors lived in this county before emigration. Did any of your Irish ancestors come from County Kerry? Like to add your County Kerry surname to our list? Just signup for your free weekly Letter from Ireland by clicking here. 0.8% of our reader’s ancestors came from County Kildare. The county had a population of 114,000 in 1841. This had declined to 64,000 by 1961. Here are the names submitted by our readers for County Kildare—they believe that their ancestor lived in this county before emigration. Did any of your Irish ancestors come from County Kildare? Like to add your County Kildare surname to our list? Just signup for your free weekly Letter from Ireland by clicking here. 2.3% of our reader’s ancestors came from County Kilkenny. The county had a population of 202,000 in 1841. This had declined to 61,000 by 1961. Here are the names submitted by our readers for County Kilkenny—they believe that their ancestors lived in this county before emigration. Did any of your Irish ancestors come from County Kilkenny? Like to add your County Kilkenny surname to our list? Just signup for your free weekly Letter from Ireland by clicking here. County Laois (also known as Queen’s County) Surnames. 0.9% of our reader’s ancestors came from County Laois. The county had a population of 153,000 in 1841. This had declined to 45,000 by 1961. Here are the names submitted by our readers for County Laois—they believe that their ancestors lived in this county before emigration. Did any of your Irish ancestors come from County Laois? Like to add your County Laois surname to our list? Just signup for your free weekly Letter from Ireland by clicking here. 1.7% of our reader’s ancestors came from County Leitrim. The county had a population of 155,000 in 1841. This had declined to 33,000 by 1961. Here are the names submitted by our readers for County Leitrim—they believe that their ancestors lived in this county before emigration. Did any of your Irish ancestors come from County Leitrim? Like to add your County Leitrim surname to our list? Just signup for your free weekly Letter from Ireland by clicking here. 3.3% of our reader’s ancestors came from County Limerick. The county had a population of 330,000 in 1841. This had declined to 133,000 by 1961. Here are the names submitted by our readers for County Limerick—they believe that their ancestors lived in this county before emigration. Did any of your Irish ancestors come from County Limerick? Like to add your County Limerick surname to our list? Just signup for your free weekly Letter from Ireland by clicking here. 1.2% of our reader’s ancestors came from County Longford. The county had a population of 115,000 in 1841. This had declined to 31,000 by 1961. Here are the names submitted by our readers for County Longford—they believe that their ancestors lived in this county before emigration. Did any of your Irish ancestors come from County Longford? Like to add your County Longford surname to our list? Just signup for your free weekly Letter from Ireland by clicking here. 0.8% of our reader’s ancestors came from County Louth. The county had a population of 128,000 in 1841. This had declined to 67,000 by 1961. Here are the names submitted by our readers for County Louth—they believe that their ancestors lived in this county before emigration. Did any of your Irish ancestors come from County Louth? Like to add your County Louth surname to our list? Just signup for your free weekly Letter from Ireland by clicking here. 9.1% of our reader’s ancestors came from County Mayo. The county had a population of 388,000 in 1841. This had declined to 123,000 by 1961. Here are the names submitted by our readers for County Mayo—they believe that their ancestors lived in this county before emigration. Did any of your Irish ancestors come from County Mayo? Like to add your County Mayo surname to our list? Just signup for your free weekly Letter from Ireland by clicking here. 1.2% of our reader’s ancestors came from County Meath. The county had a population of 183,000 in 1841. This had declined to 65,000 by 1961. Here are the names submitted by our readers for County Meath—they believe that their ancestors lived in this county before emigration. Did any of your Irish ancestors come from County Meath? Like to add your County Meath surname to our list? Just signup for your free weekly Letter from Ireland by clicking here. 1.4% of our reader’s ancestors came from County Monaghan. The county had a population of 200,000 in 1841. This had declined to 47,000 by 1961. Here are the names submitted by our readers for County Monaghan—they believe that their ancestors lived in this county before emigration. Did any of your Irish ancestors come from County Monaghan? Like to add your County Monaghan surname to our list? Just signup for your free weekly Letter from Ireland by clicking here. County Offaly (also known as King’s County) Surnames. 0.9% of our reader’s ancestors came from County Offaly. The county had a population of 147,000 in 1841. This had declined to 52,000 by 1961. Here are the names submitted by our readers for County Offaly—they believe that their ancestors lived in this county before emigration. Did any of your Irish ancestors come from County Offaly? Like to add your County Offaly surname to our list? Just signup for your free weekly Letter from Ireland by clicking here. 2.5% of our reader’s ancestors came from County Roscommon. The county had a population of 254,000 in 1841. This had declined to 59,000 by 1961. Here are the names submitted by our readers for County Roscommon—they believe that their ancestors lived in this county before emigration. Did any of your Irish ancestors come from County Roscommon? Like to add your County Roscommon surname to our list? Just signup for your free weekly Letter from Ireland by clicking here. 2.6% of our reader’s ancestors came from County Sligo. The county had a population of 180,000 in 1841. This had declined to 54,000 by 1961. Here are the names submitted by our readers for County Sligo—they believe that their ancestors lived in this county before emigration. Did any of your Irish ancestors come from County Sligo? Like to add your County Sligo surname to our list? Just signup for your free weekly Letter from Ireland by clicking here. 4.7% of our reader’s ancestors came from County Tipperary. The county had a population of 435,000 in 1841. This had declined to 123,000 by 1961. Here are the names submitted by our readers for County Tipperary—they believe that their ancestors lived in this county before emigration. Did any of your Irish ancestors come from County Tipperary? Like to add your County Tipperary surname to our list? Just signup for your free weekly Letter from Ireland by clicking here. 2.9% of our reader’s ancestors came from County Tyrone. The county had a population of 313,000 in 1841. This had declined to 134,000 by 1961. Here are the names submitted by our readers for County Tyrone—they believe that their ancestors lived in this county before emigration. Did any of your Irish ancestors come from County Tyrone? Like to add your County Tyrone surname to our list? Just signup for your free weekly Letter from Ireland by clicking here. 1.7% of our reader’s ancestors came from County Waterford. The county had a population of 196,000 in 1841. This had declined to 71,000 by 1961. Here are the names submitted by our readers for County Waterford—they believe that their ancestors lived in this county before emigration. Did any of your Irish ancestors come from County Waterford? Like to add your County Waterford surname to our list? Just signup for your free weekly Letter from Ireland by clicking here. 1.5% of our reader’s ancestors came from County Westmeath. The county had a population of 141,000 in 1841. This had declined to 53,000 by 1961. Here are the names submitted by our readers for County Westmeath—they believe that their ancestors lived in this county before emigration. Did any of your Irish ancestors come from County Westmeath? Like to add your County Westmeath surname to our list? Just signup for your free weekly Letter from Ireland by clicking here. 2.2% of our reader’s ancestors came from County Wexford. The county had a population of 202,000 in 1841. This had declined to 83,000 by 1961. Here are the names submitted by our readers for County Wexford—they believe that their ancestors lived in this county before emigration. Did any of your Irish ancestors come from County Wexford? Like to add your County Wexford surname to our list? Just signup for your free weekly Letter from Ireland by clicking here. 0.8% of our reader’s ancestors came from County Wicklow. The county had a population of 126,000 in 1841. This had declined to 58,000 by 1961. Here are the names submitted by our readers for County Wicklow—they believe that their ancestors lived in this county before emigration. Did any of your Irish ancestors come from County Wicklow? Like to add your County Wicklow surname to our list? Just signup for your free weekly Letter from Ireland by clicking here. Want to find out what the top 10 Irish surnames are? – click here to find out. So, that’s it for this Irish surname update. Remember, if you would like to add your surname to our list, all you have to do is sign up for your Free Letter from Ireland below. My family name is Malloy. As far as I know my grandfather came from Belfast. I WAS A WHITESIDE BEFORE I GOT MARRIED M Dad was Edison his parents wEre Robert and Lucy. My grandfather was Angus McMahon and came to Canada as a boy. How I would like to know more about Ireland and where my great grand parents came from. My love for a country that I have yet to visit is somewhat strange as I have felt this way since I was in grade school! Really would have liked to be able to type in my surname and have a match to a connection come up. Love the footprints and names, just difficult to find my connection. My surname is Storrie. My grandfather was Cornelius Caffrey – his father was John Caffrey – which County did he come from please. My Maiden name is Boylan. My Boylan Family came from County Cavin! Grandmoms maiden name was Kane and her mom was Walsh! Don’t know where they came from? Possibly County Cork? It disappoints me to see my surname ‘Fitzsimons’ (pronounced Fitz-sigh-mons), spelt here in at least Meath and Down as Fitzsimmons (Fitz-him-ons). Many people, especially from the USA and Canada (and a few from Australia and NZ), have had their Fitzsimons name misspelled in the past as Fitzsimmons and now think that is the correct way to spell and pronounce the name. Most, especially from the USA and Canada when they find their Irish Fitzsimons family, refuse to accept the correct spelling and pronunciation. The incorrect spelling of the name here only adds to this misconception and confusion. Fitzsimons is the ‘son of Simon’ not the son of Simmons! Theres a simple explanation for that Mick, the Simon in Fitzsimmons evolved as a French pronunciation across much of Ireland – and so we have the soft “i” in Simon instead of the hard English “i”. When the name was anglicised, it took on the literal spelling of the French pronunciation. Mike. And was to recognise the connection to a family without the legal benefit of acquiring their surname through marriage. Family legend states my maternal great grandfather on her mother’s side (her grandfather) was from Belfast His name was James Patrick Keelan. He was killed on day 1 of the Somme July 1st 1916. His daughter my grandmother was Ann or Nancy Keelan. On my grandmother’s mother’s side the story is that her grandparents were Ryan and Rooney allegedly from Ireland’s west (believe Mayo). The Whites hailed from Skerries in Co Dublin I think. John, do you know anything more about your Mayo Ryans? I’m descended from John and Julia Ryan, born ca. 1800, emigrated to Ohio. Their son John married Mary Ready. I know Ryan is a very common surname, but I thought it was worth asking! Anyone have information on the name Carver? I was told the family originated in Ireland but have no records or solid information. Anything would be helpful. Obviously O’ Malley from Mayo has to be there but I wonder is Fox my husbands mothers maiden name. My mothers maiden name is Glynn. My name by marriage is Silverthorne, don’t think that is Irish! My great grand parents were born in Ireland William Bowmman Kingsley born in Boresleigh Tipperary and Susan Eason born in Westmeath they were married in Athlon before coming to Australia does anyone know more about them? My Granfather was named William Henry Lawler. His father was from Kilkenny. Looking fir Sur name Hinchy and Quigley. My grandmother was a Sheehan and one was a Butler. Hinchy came from Dingle. We visited Ireland in Oct, We just loved it there.My maiden name was Fitzpatrick and i married a Fagan , we are very Irish. I live in Nova Scotia Canada and my paternal grandmother came here from County Cork. She was a Doyle. Some of my relatives were Callaghan from County Derry. A place called Limavady. I’m a Scot living in Canada, my mother and her parents were from Limavady. I am looking for Tedfords and Woodhouse from County Armagh. I would like to add our family surname McQuaide. My 4th Gr. Grandfather Patrick McQuaide was born in County Down in 1743. I was told my fathers family came from Ireland in 1700 to Canada. Last name is Guest. My fathers mother was a Guest. Where in Ireland did the Guest live. I had CALVERT of Tyrone, HARKIN also Tyrone (also reputedly Donegal, McFARLAND of Tyrone (I thought it was a Scottish transplant!). McGETTIGAN of Tyrone, DOUGLAS (also a Scottish invader I thought) of County Cavan (Virginia). BENNET also of Cavan. My Maiden name was O’Sullivan. My Grandfather came from Dublin. His name was Patrick Francis cant get much more Irish than that. I’m sure this is a great and interesting read… except you can’t search a name… Seems like a real miss. My mother’s maiden name is Collins out of county Cork. Her mother’s name was Nash, but I don’t know what county. My Gr.Gr. Grandmother was Ellen COLEMAN and I have idea what county, in Ireland she was from but arrived in Canada Circa 1851. I’m from many Irish families, but the most recent were the Siftons of Clonmel Tipperary, the Greggs and Walkers of Sligo ( or nearby) and the Hudsons of Sligo. I have the last name Myles and it is m grandfather ‘s last name. I know it is Irish but I gave nothing else to go on. Lots of typos sorry….my grandfather on my dads side and I have nothing else to go on to find out more. I’m curious: why make it so difficult to look for names in each county? A simple alphabetical list would be more user friendly. Yes! Graphically interesting, but too time- consuming to be useful. Thanks for your feedback Susie. In the interest of variety Gary! Can you tell if the surname “ORR” is also on the Irish list? My grandfather’s name was Mc Garva-Ibelieve he came from Ireland. My maiden name was Dunn. Edward Dunn came to Australia in 1856 with his wife Margaret (McMahon) although I don’t have a marriage certificate. They had son Patrick on the voyage, then 12 more children. I am a desendant of their son Thomas. My paternal grandmother was Clara Sarsfield. Her parents came to Wisconsin, I believe, where they worked in a dairy. They then moved to just outside Spokane WA where they started their own dairy and built an acclaimed Arts and Crafts style home. I would love to know of any contacts in either County who might know of a linkage to their American cousins. Cuningham at Ballymena. Note only one “n” not double n together in spelling. I would agree with comments that it would be nice to be able to search by name. If the “word clouds” are formed from data collected from subscribers, presumably these could change as time goes on and more people subscribe? My computer knowledge is not much more than using a keyboard (!) but I would have guessed that it was possible to have a search box which leads to this database? Looking for Leahy family of Co Cork. Thomas & Catherine Leahy dtr Mary Leahy sailed on the Mary Harrison aged 25 to Western Australia 1862. Would love to find where in Co Cork they lived and more on the family..
My 2X great grandparents came to Canada (Lac-Beauport, Quebec) in the mid 1800’s. They married there. She was Margaret Guthrie and he was Jacob Pierson. From the records that I have found on Ancestry.ca, Margaret was born in December of 1835 and married Jacob in September of 1853 in Lac Beauport. From his age on the marriage records, he was probably born in 1822. Jacob died in 1893 in Quebec and Margaret moved to Ontario to be with my great grandparents in Toronto where is died in 1912. However, that is all the info that I have been able to obtain about them–nothing really of where they came from in Ireland. They were Protestant and in all probability their families originally were Scottish. However, that is all that I have found out about them. Find a Chirch of Jesus Christ of Latter Day Saints church near you and visit their family history center; it is open to the public you don’t have to be a member; they may be able to help you because they have so many resources available and people in the centers to help you! I grew up in Toronto – there were two unmarried Daoust sisters down the street- Indian Rd.Crescent –one was named Hazel. They have both passed away within the last 10 years. I have had great results with my family tree doing it with ancestry.ca You can also do the DNA which gives you more connections. Is there a way to check the origin the other way around (i.e. typing a family name and the result would show the county of origin)? I’d like to do the same. My maiden name was Helen Ann McBride. I was born in Craigavad, County Down, N Irekland. My father’s name was John Fredrick Cobb McBride and my mother’s name was Janet Isobel McBride (nee Rutherford) both born in Belfast. My maternal Grandmother’s maiden name was Mulholland, she married a Scot, who’s surname was Combe and his sister (Combe ) married a Scot and his surname was Mulholland. They returned to Overtown, near Glasgow, Lanarkshire Scotland. My maternal grandparents resided in Ontario Canada. My g grandfather, Robert Carson McAloney was from Londonderry- Coleraine. He eventually landed in Montreal, Quebec, Canada and then St. Catherines, Ontario where he is buried. I wiould love to know if there are still any living relatives in Ireland. I’d like to visit there some day. My name is Jan Corley living in Peterborough, Ontario, Canada. Thank-you in adavance. I’m looking for George Macartney Caldwell and brother Samuel Hercules Rowley Caldwell and their father Rev Hugh Caldwell from Newtownards whose father was a Samuel Caldwell from Derry Ireland. My family was the Nortons they came over from Ireland in 1847 and settled in Ticonderoga ,Ny ,Usa. Their names were Ellen and Miles Norton. They had a large family of I believe 7 children . I do not know what part of Ireland they are from but I do have know where. I have dates if that would help anyone! I am looking for living descendants so I can compile stories and memoirs for my daughter. All my life I’ve been called a little irsh girl and never really paid any mind to it turns out there is a reason was the nickname has stuck. My red hair came from somewhere and know ! I am on facebook under Britt Richelle iof you have info please contact me! Our surname is Feeney. My husbands great grandfather was a tailor on sack villeins Street in Dublin. I have traced back to Thomas Feeney born Ireland in 1844 but can not get any further because of records being destroyed by fire in Dublin. We would love to find out where they lived. Before the family coming to England. Our surname is Feeney. My husbands great grandfather was a tailor on sackville Street in Dublin. I have traced back to Thomas Feeney born Ireland in 1844 but can not get any further because of records being destroyed by fire in Dublin. We would love to find out where they lived. Before the family coming to England. My Grandfather’s surname was “ORR” can you please tell me if it’s irish. Orr is a very common name in County Down and Antrim, I myself am an Orr. There are a number of Orr,s buried in Comber Cemetery. Several Orr’s came out of East Belfast. Working in the Shipyard. My family moved to Canada in 1967. I returned to Northern Ireland in 2014 . Orr,s and Cowan’s were closely tied to each other.my Dad John had is mothers maiden name as a middle name Cowan. Orr . My daughter has done extensive family tree search. Hope this helps. I never see my maiden name Harte what county is it from. Which county does Harte come from. I’m a South African and my Grandmother, born Eileen Agnes Parkinson, is believed to be of Irish decent. .
My family name is Laughlin from Strabane N.I. THEY EMIGRATED TO Trinidad & Tobago or came as slaves and started the first newspaper there called the Trinidad Gazette. As it turns out the newspaper in Strabane is the Gazette. I believe that this was in the 1700s……. My maternal grandfather was Irish and his name was William Freer, sadly I don’t know where in Ireland he was from. Any info would be great. Looking for McWilliams. My mother’s father’s family was from Ireland. Thinking they were from up north but not sure. My mom was named Clare. My dad’s side has McCabe, Brown, Fitzpatrick Brownlee, Graham and Robinson. Thought maybe Robinson was English? Here are my 2nd great-grandparents. Catherine Haggart (1835) from Roscommon & Hugh Gallagher (1833)from Leitrim. They came over to England in the early 1850s, they apparently met on the boat. They married in 1854 in Birmingham, their family lived in Bordesley for the rest of their lives. My gt gt grandfather was Christopher Taylor from Sligo, came to UK in 1848 with his wife Catherine.. Yes my Dad’s family are Murphy’s from Cork.Was in Ireland …LOVED IT!!! FROM ALBERTA CANADA. My mother’s ancestors were from Antrim in Ulster – McElman. They settled in Canada in 1764. Various forms of the name were Mckilmun, McIlmun, McElmun, McIlmon etc. These names are now extinct in Ireland, but common in Nova Scotia Canada. Would be so much easier to check the surnames if they were listed alphabetically rather than pictorially. My wife’s name is Kinlan and she is sure that she has Irish descendants. I am seeking others with the surname Crozier, descendants of those who remained behind when my ancestor, Richard Crozier, emigrated from Tyrone to Canada in about 1835. I have so far been unable to find the names of his parents or any other relatives, although I continue to search in both Canada and Ireland, through websites, online searches, and archival research. Any thoughts or assistance would be so appreciated. My wifes’ maiden name is O’Brien, her parents names Robert James O’Brien and Enid Mary O’Brien nee McGowan, Grandparents are James O’Brien and Mathilda O’Brien nee Joseph and Great Grandfather is Timothy O’Brien. We believe this O’Brien family hail from County Cork, but Robert James O’Brien was born in Calcutta in 1900 and James O’Brien married Mathilda Joseph in Calcutta on 18th February 1884. We would love to know more about their Irish heritage and roots. I was looking for Hodgins in county Tipperary. I am a descendent of the McNamara’s of County Clare and the Scott’s of County Antrim. I have been finding many of my McNamara relatives had lived in County Antrim, but history says the McNamara seat is in Clare. I’m looking for additional McNamara and Scott connections in either County. I see the name Mulligan there but my family’s name is Mullighan. Can you tell me what the difference is please? My great gr and father,Richard Foy, was born somewhere in Ireland about 1843. His father was Patrick. He was an orangeman. He married Jane Madden in Manchester Cathedral in 1867. Does anybody know where he came from, please. Where did the Dinning name originate? Plantation ? Also Sperring, Spierin, and derivatives ? My great Grandmother’s name was Mary Lucy and though she was born in Wales, her family came from County Kerry. I do not see the “Lucy” name on any of these area maps and particularly not in Kerry. My surname is NUGENT and I have traced my line back to my 2 x gr.grandfather Francis who was born about 1799. He lived and died (1869) in Co.Tryone but I have not found any record of his being born there. It was interesting to see that the NUGENT name does show up in 7 of the counties. I knew that the NUGENT name was significant in Co.Westmeath but I can find nothing to connect my family to this prestigious lineage. I shall start researching some of the neighbouring counties to Tyrone for a birth record for Francis. He was married to Elizabeth (aka Isabella, Bella) who may also have been a NUGENT before her marriage to one, perhaps a cousin of Francis but I have had no luck in finding a birth record for her either. She was born abt. 1813 and died in 1903 in Cookstown, Co, Tyrone. I enjoyed looking at the surnames, not many Irish names start with N do they? My great grandfather’s name was Dewitt Dudley. Yet I don’t know what region the family came from. I have been looking for a while. My Murphy family came from Roscommon. Have yet to find out where our Mooney family came from. We also have Murphy from Roscommon! I would love to find the family parish(es). Family of Donegan and Callghan from County Meath. Grandfather. Died before I was born. my great grandfather’s name was BAILE. can you tell where that is from? My mother’s maiden name was McAtee,what county did tnat name from. Her grandfather was John Kinnie/ Kynnie McAtee. My fathers grandfather was Isaac Fernihough……where in Ireland did they come from? My Great Great Grandmothers maiden name was Atcheson and i believe they came from Dromhoney, County Armagh…but only found name in County Cavan…it can be very confusing when you don’t know much about their history. My Maternal grandmother was named Clementine O’Quinn and my middle name is O’Quinn. Father was McKinnon, Mother, Ahearn, Grandparents Glynn. My great grandad Denis was yet another Ryan from Tipperary. He was in the army so his kids were born in different locations over Ireland and England. Luckily my grandad Thomas Ryan was born in Armagh so I am now the proud possessor of an Irish passport. My great grandmother was Margaret White from Kells, Co. Meath. The Sweeney side is a bit further back so tracing them is being a tad more difficult. As well as Ryan, White and Sweeney I also have Feeney, McGuire, Regan and Phillips (and a different line of Sweeneys) but these are all of unknown location as of yet. Lots more work to be done on my part. I found my surname Carson in County Antrim and County Armagh! Thanks! My mother’s family was Cork, they to America sometime in the late 1800 or early 1900 hundreds. My mother’s father name was Timothy Edward Driscoll but I’m not sure of his fathers name. They said they drop the O in O’Driscoll after they got to America. I’m not sure if my grandfather was born in America. Could not find my name Mara, anywhere? My father, Cornelius Kelleher, born in County Cork in 1902. The family remains in Ireland. My grandmother was Suzanna Mc Randall from Belfast. Maiden name was Knapton and my mother’s maiden name was Pinfold and her mother’s was Greensides. I am told we are of Irish, Scottish and English descent. Thanks for getting in touch Marilyn. One of my ancestors came fromDromore, Tyrone. His name was James McGrath and he was sent to Australia as a convict. After his conditional pardon, he married Susan Corrigan in Sydney, NSW. James and Susan had three children, a girl and two boys. Henry and James were the sons and my grandmother was the eldest daughter of Henry McGrath. Her name was Susan Annie McGrath and they lived firstly at Camberwara and then Green Hills outside Nowra. Henry also had a property at Braidwood in NSW as well as one at Bundanoon, NSW. Thanks for getting in touch and sharing that family info with us on The Letter from Ireland. My Grand mother on my mother’s side was a McNally. I’d love to find where they came from in Ireland. Please help. I believe my great-grandmother Anne Frances Moran came from County Mayo in 1901 or 1902, possibly from Carrowmacloughlin. Her parents were Patrick Moran and Nora Roach. I was told that my Snow Family came from County, Cork, Ireland. My great-grandparents (or possibly great-great) were Patrick and Mary McCarthy. They are buried in Pittsburgh, Pennsylvania. Sadly I don’t have any other information about them. That was fun to look at! My great great grandmother Ellen Dooley from Kilkenny married Arthur Donnelly (who came from Belfast it is said) my great great grand father. Their daughter, Rose Donnelly married John Hughes. John Hughes is very confusing as to where he really came from in Ireland. I will guess Belfast. Their son, Joseph Hughes was my grandfather. All these folks settled in Paterson, New Jersey. Mary Norwood was my maternal grandmother. Her father came from Monaghan. Family names: Quigley, Donohue, MacFarlane, Brophy. My mother was Julia Norwood-Hughes. Thanks Harriet. Delighted you found it fun and informative. Have a look here Mary and see what you discover as a start in the Steele surname search.